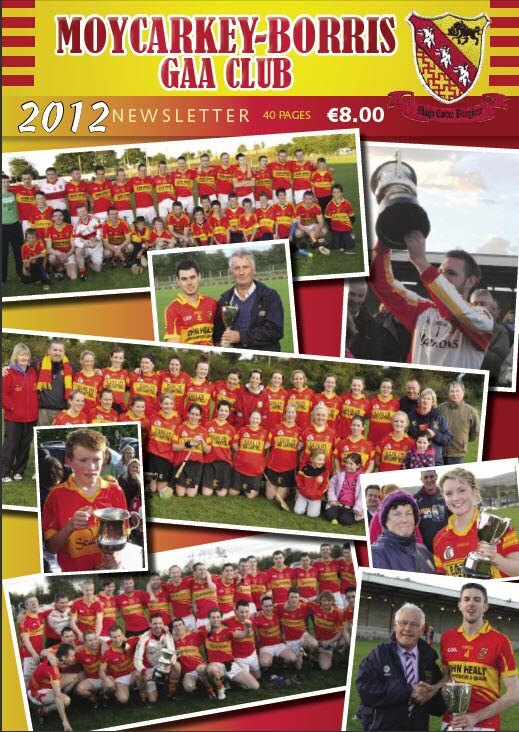 The 2012 Moycarkey-Borris GAA Club Newsletter has been launched at the Club AGM on Friday December 7th. The newsletter includes a full round-up of all the successes on the field at adult level and a comprehensive review of each of the juvenile teams from Under 6s upwards. 2012 was also a successful year for Camogie and Ladies Football which is covered in detail as well as coverage of success as schools level, Scor and having 2 Moycarkey-Borris club men honoured with Cumann na Sean Ghael awards last month. The 40 page production priced at 8 euro is available in the local shops in the parish and is an ideal present for young and old either at home or away. All profits from the sale of the newsletter go towards the running of the club for the year ahead.